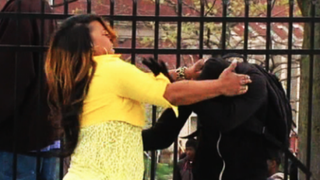 Even before Toya Graham, the Baltimore mother of six who was captured on video “disciplining” her son, began making the news rounds, she was already being hailed as a hero. I absolutely don’t think that she handled it the best way, but I think it was the best way she knew how in the moment. While I have the luxury of sitting at my laptop debating the moral quandary of it all a few days later, Graham didn’t have that same luxury when she spotted her son in a crowd of protesters. She wasn’t thinking philosophically or about what bystanders would say or whether there were cameras rolling or whether her actions would soon be viewed by an audience watching on their cellphones. She was reacting as she thought about her son getting himself killed by police out in the streets of Baltimore. She told CBS News, “I didn’t want him to be a Freddie Gray,” referring to the 25-year-old man who died after he was seriously injured under suspicious circumstances while in police custody. Graham’s fear for her son if he was anywhere near the police, much less antagonizing them, has merit. Graham was scared and she was admittedly angry. Her only son was putting himself in harm’s way, and undoubtedly she was desperate to protect him. Graham, as she describes it, “lost it.” I won’t condemn Graham’s reaction. But I will point out the hypocrisy of people who applaud Graham and yet condemn Baltimore’s protesters, who have been called “thugs” and “animals” and everything but a child of God, when their reactions and Graham’s are one and the same. It’s not a huge leap of logic to see that Graham’s anger and fear—along with the resulting violence—and the protesters’ anger and fear—and resulting violence—come from the same place. And if you can find the empathy to cheer for Graham’s methods of saving her son, also find some sympathy for the people of Baltimore who are trying to save themselves.